Mark T. Jansen, M.D., sits in a chair given to him as part of the investiture ceremony, while Chancellor Dan Rahn, M.D., and College of Medicine Dean Pope L. Moseley, M.D., look on. 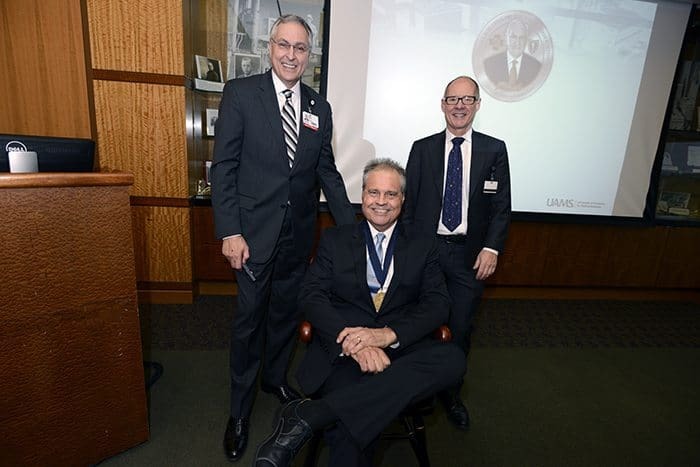 April 8, 2016 | April 8, 2016 | Mark T. Jansen, M.D., of the University of Arkansas for Medical Sciences (UAMS), was invested April 4 as the inaugural recipient of the Arkansas Blue Cross and Blue Shield, George K. Mitchell, M.D., Endowed Chair in Primary Care. The chair was established with a $1 million grant to UAMS in 2015 from Arkansas Blue Cross and Blue Shield. 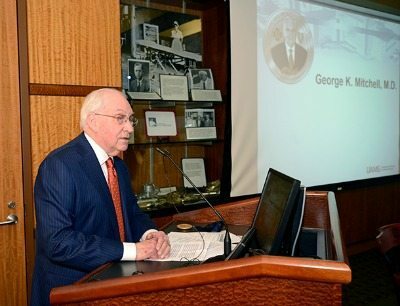 It honors Mitchell — a UAMS graduate and Arkansas Blue Cross board member and retired president who led the health insurance company for nearly 20 years. The endowment calls for the chair holder to focus on innovations to meet the Triple Aim of health system reform — better patient experience, improving the health of the population and decreasing the cost of care — through the incorporation of team-based care, health promotion, health literacy and population health strategies into primary care settings. It is a UAMS-wide chair with a chair holder to be appointed on a three-year, rotating basis. Jansen was presented with a commemorative medallion by UAMS Chancellor Dan Rahn, M.D., and UAMS College of Medicine Dean Pope L. Moseley, M.D. Speakers at the event included Stephanie Gardner, Pharm.D., Ed.D., UAMS provost and chief academic officer; Mark White, president and CEO of Arkansas Blue Cross and Blue Shield; Mitchell, for whom the chair is named; Anne Jansen Broadwater, Jansen’s sister; and G. Richard Smith, M.D., UAMS professor of psychiatry, internal medicine and public health. Jansen joined UAMS in 2013, and was selected as primary care medical director for the Center for Healthcare Enhancement and Development, which explores ways for UAMS to support and work with hospitals and clinics throughout the state to provide better care for Arkansans. Jansen also serves as UAMS’ medical director of Regional Programs as well as the medical director of Physician Relations & Strategic Development. Mitchell, who graduated with honors from the UAMS College of Medicine in 1956, was president and chief executive officer of Arkansas Blue Cross from 1975 until his 1993 retirement. Prior to joining Arkansas Blue Cross as medical director in 1968, he was a co-founder and senior partner of the Little Rock Diagnostic Clinic. He served on the Arkansas Blue Cross board from 1964 to 1968 and from 1986 to the present. He also is a Blue & You Foundation for a Healthier Arkansas board member. 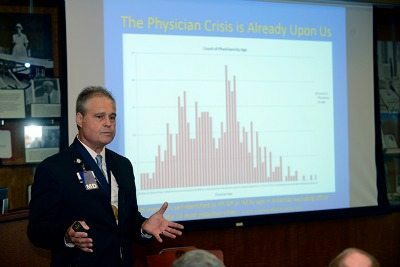 Jansen discusses the state of primary care in rural Arkansas. After thanking the Mitchells, his own family and those in attendance, Jansen stepped away from the podium to give an informal talk on the state of primary care in rural Arkansas. Jansen pledged to address the shortage of primary care providers in the more rural parts of Arkansas, using telemedicine technology to deliver specialty care to rural areas and to serve as a platform for information sharing and medical education. Jansen is a 1981 graduate of UAMS. He completed his family practice residency with the University of Oklahoma, Tulsa Medical College in 1984. He and his wife, Cynthia, moved to their single-physician practice in Arkadelphia that same year. He later became senior partner of Arkadelphia Medical Clinic, a multi-provider group. Jansen practiced for 29 years in Arkadelphia before joining the UAMS faculty.